If it didn't sound so wet, "Geddit?" could take from Kerraangg!! as the onomatopoeic phrase for this period of Rush's career. After their ticklish remarks about cinematic aspirations this time last year, you'd think that this is about the silver screen. It is but really isn't. The cover is worthy of Hipgnosis (hi Sleazy) at their trickiest. The front is a throwaway pun (but in which direction is the '2112' logo going? ), and the inner sleeve throws another tangent on the title. The back cover up-ends the front, and completes the conceit. I'll leave the paranoid among you to wonder if it's Neil Peart or an escapee from 'Don't Look Now' in the hooded coat, why the woman is dancing with the clipboard, and what they are doing to the guy with the '2112' logo. Perhaps it all means that Alex is dead. The music inspired some really fancy steps in my front room mere seconds into side one. 'Tom Sawyer' strolls open with cool drum pulse and buzzing oscillator before swinging into one of their effortless vertical takeoff rockers; aloof drums sliding into a sizzle of percussion, guitar burning overhead and bass hopping from one beat to the next. At one point, the floor gives way and Geddy plunges into a killer riff, the synth wailing down after him. Cor! The gent of the title is, of course, Everyman to Peart's philosopher. 'Red Barchetta' moves at a slower pace, shining towards pop but with a clamorous staccato passage and some violent HM earthmovers in between. The car of the title is an instrument of social deviation, driven by the protagonist in a futureworld where cars are banned. The smart money is on 'YYZ' to have the headbanging dervishes in spasms when Rush tour. It's an instrumental gallery of hernia-inducing riffs, some exotic, some overblown Guignol, others neo-classical with an eye towards Y*s. Has someone phoned the St. John's Ambulance? Just to prove that they can swing as well as bombard, they end the side with 'Limelight'. The 'artist-enchained-by-audience' lyrics would read better in Hammill's 'Energy Vampires', but the song draws you into a whirl of chiming guitar, locomotive drums and rising bass that just goes rising up into the wide blue yonder. Beautiful. Side two opens with 'The Camera Eye' and you think you've caught me out but you haven't. The lyrics and overture of street noises (do we detect a cheeky typewriter tapping in the background?) are grid references pointing to Dos Passos and/or the metaphors inherent in the action of the still camera. Part One marches in, sounds an alarm on synth and proceeds to cut a cranky time-signature between their balladish aspects and art-rock leanings. They almost go into a dub for the opening of Part Two, but quickly blast into a fiery reappraisal of the themes from the first part. Sounding the absolutely final knell for all this right-wing garf comes 'Witch Hunt' (apocryphally subtitled 'part III Of Fear), on which Peart rails against a nightmarish tableau of 'vigilantes' ; racists, xenophobes and bookburners who feel they 'must rise and save us from ourselves'. A creepy kiddie toy picks out an ominous little ditty, a lynch mob jeers from back in the mix and a portentous march builds into a majestic pomp-rock song ; part climactic Hollywood choiring, part menacing rock classicism. I just dion't know how the diehards will take 'Vital Signs' ; a song containing elements of the sort of music they write in to Sounds and moan about. It's opening (repeated) section is a tight little beat straight out of ska, and the mid-section has a fluttering synth repetition that might be on secondment from Cologne. It does resolve into a rock treatment of these themes, but Geddy still ends in a black vocal mode. Take that you loon-panted bigots! So. 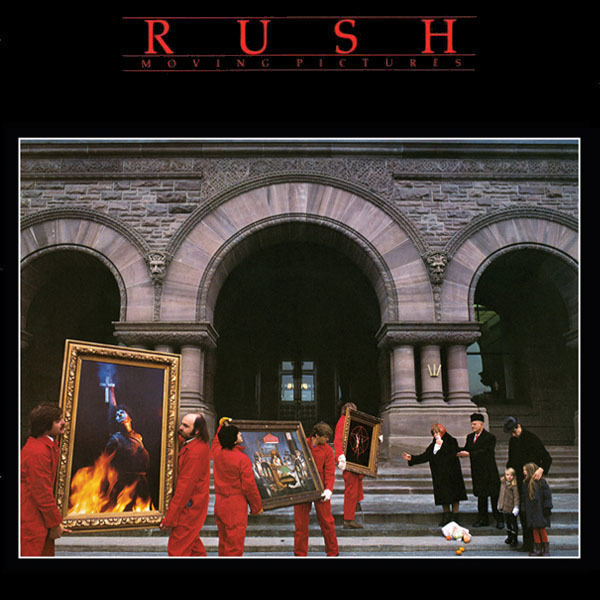 there you have it: this year's best Rush album ever (only joking). The feared defection into the Yes territory never happened ; indeed, 'Permanent Waves' and 'Moving Pictures' (hmmm) see them veering back into the mainstream. Admittedly, it's grown beyond the headcrushing rifferama (copyright : G. Barton) towards a refined HM that gets played on the radio, and some denim neanderthals may feel betrayed. But this is impeccable rock : violent, frightening, exciting and fed up with the rules of HM. That's why I nip over from the tinkly-bonk to cheer them.